Ethernet plays a major part in todays industrial automation systems, relying on data being passed through the system at high rates to underpin the performance of these networks. The digital performance of a network is subject to the active devices within the networks such as switches and controllers. However it is the passive devices such as cable and connectors which can ultimately determine a networks performance. It's Easy to Confuse MHz Performance with the Megabit. classes, therefore providing additional performance margin in any given application. Stranded ethernet cable does not have the same performance characteristics as solid conductor. This must be remembered when distance is a factor. Ethernet conductors are typically 26AWG and 24AWG, and it is always best to use the largest size when requiring high data rates over long distance. The Profinet standard saw 22AWG cables being introduced, with this wire size there is significant transmission performance advantage over 26AWG and 24AWG, and full 100m segment length can be achieved with stranded or solid cable types. Three types have been defined within the Profinet standard (see table below). Care must be taken to select the correct RJ45 connector when using 22AWG cables as many are not compatible with the increased wire size and the larger o/d of profinet cables. Spare conductors in an ethernet cable can be used to provide power to ethernet devices. Clearly, wire size is important in the calculation of voltage drop in POE applications, and is important to bear in mind in cable selection. Industrial environments require cables which are far more robust than those used in office environments. Materials such as PUR are often used to provide mineral oil resistance, high abrasion resistance and are halogen free. Ethernet cables are available with solid conductors which are only suitable for static applications (Type A) and stranded conductors, typically with 7 strands for flexible use (Type B). Highly stranded cables, typically with 19 strands are suitable for continuous movement (Type C), for example in drag chain applications. 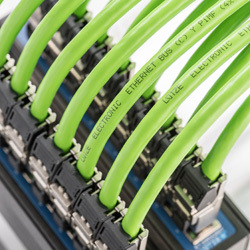 Lutze design and manufacture high quality cables and connectors for your industrial networking application. If you want to discuss your requirements or get a quote for any type of Lutze cable, please give us a call on 01254 685900 & we'll be happy to help.